This is unofficially the age of information design. Visualization is in vogue. Information is suddenly beautiful. Data is free flowing, ready to be poured, molded, sculpted, and remixed at will. Displays of facts and figures are everywhere, from newspapers to magazines, websites to television, public spaces to the palm of one’s hand. But amid this frenzy of info-obsession, a fundamental clarity is sorely lacking. For a field centered on demystifying, clarifying, and explaining the complex, information design has a lot of explaining to do for itself. Does anyone really understand what information design is or isn’t given the state of affairs today? Is it possible to achieve a holistic, unified view of the field — from academia to professional practice to the public sphere? Before diving into the issue, let me provide some context. I live and breathe information design, practicing daily and surveying constantly. I’ve done so for the past twelve years, beginning with an undergraduate thesis specifically focused on information design. In raising these issues here, I am sharing a point of view informed by my experience as an information designer and opening up a broader conversation on this topic — deliberately leaving loose ends untied for the sake of further exploration. It is also important to note that the field of information design has been continually evolving and growing over time, thanks to work of individuals and organizations who have sought to give it form and meaning. The concerns I list are less criticisms of any efforts to bring clarity than reflections on the confusion that exists today, brought about by the enthusiastic over-production of “info-stuff” and the underdeveloped efforts to synthesize and crystallize real knowledge that advances the field. For the sake of this post, I am using the term “information design” to refer to the broad spectrum of work that deals with making all types of content and data understandable and usable by people — regardless of the specific tools or technology involved. There is a strong graphic element to information design, but I wouldn’t limit it to the only element. Ambiguous language and varying definitions are central to the confusion that surrounds this subject — and have been for some time — so I recognize that my own use of the term may draw criticism. 1. There is yet no single, widely-accepted definition of information design. Each of these definitions provides a window into a broader, though still incomplete understanding. It isn’t fully apparent what is considered information or by what skills or means one makes information understandable? Of course, a more exhaustive survey of definitions and descriptions could certainly raise more questions than answers (particularly in the realm of graphic design), but suffice it to say that clarity is still needed. Looking more closely, information design has long escaped easy definition for numerous reasons. There is debate over whether it is an off-shoot of graphic design, a distinct field unto itself, or a hybrid of many different fields united by a shared purpose. Hand-in-hand with this debate is the question of information design’s history and origins; some think it began with the cave drawings, others think it was a 20th century phenomenon, and yet others place its beginnings somewhere in the Renaissance. Can there ever be a truly far-reaching history of information design? 2. There are no clear professional boundaries around information design. Answers to these questions are as elusive as the aforementioned definition and origin. Still, there are several consequences of this lack of boundaries and disconnection, ranging from poor public understanding of information design as an actual profession to marketplace confusion over what qualifies as an “information design problem” and who is skilled enough to tackle it. To that last point alone, no professional standards exist for what information designers do nor is there clear recognition or delineation of agencies doing information design work. Every practitioner and agency paves their own way by the types of challenges they tackle, services they offer, processes and methodologies they follow, and deliverables they produce. 3. More emphasis is on execution and visual appeal than analysis. Armed with an array of sophisticated tools, today’s visualization professionals can readily gather raw content and produce a multitude of views showing as many diverse perspectives as graphic treatments. But the real usefulness of many of these outputs is questionable, as function takes a back seat to form and process yields to product. Designers (professional and otherwise) take much creative license with content when creating works of information design, making it more beautiful than functional, presumably for the sake of public appeal. Examples of this abound. For instance, GOOD magazine has done a noteworthy job of incorporating information design in clarifying social, political, and environmental issues, but I often cringe at what gets published in the Transparency section. So much rich data, yet so few skillful or insightful visualizations. Would we have such a proliferation of information design artifacts if tools and technology weren’t so readily available — and if more time and mental energy were invested in the content? 4. It’s hard to find places to study information design. It’s no surprise that the present confusion and lack of clarity within and around information design would pose challenges for those pursuing a formal education in that area. Only a handful of colleges and universities offer any degree programs in information design: Carnegie Mellon, Bentley University and The University of Reading (UK) notably number among them, yet even these programs vary in what is taught or not taught. Some schools fold in a course or perhaps just an assignment or two within a traditional graphic design curriculum. Others assist students in pursuing independent studies and tailoring their courses to suit their interest. As I write this, I don’t know for certain how many programs actually fall under these categories, but I’m sure a listing of those schools would benefit many aspiring information designers. 5. It’s hard to find quality resources dedicated to information design. 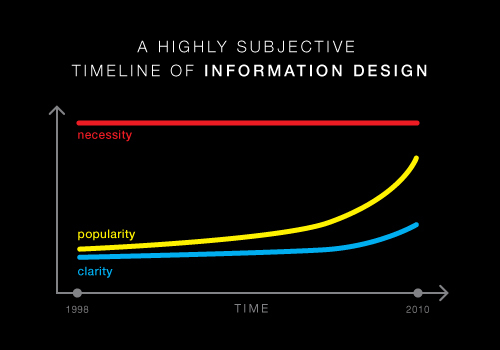 There’s a lot of stuff out there about information design. The problem is separating the good from the not so good. Books abound on numerous facets of information design, but in my experience, only a handful yield any lasting benefit. (I have to write a post just on books some time.) Some websites aggregate related content, creating a highly selective view depending on what is most popular, visually attractive or novel. Other sites, like Information Aesthetics and Visual Complexity provide a good current survey of projects and developments in data visualization, but there is little by way of critical thinking or deep analysis. Flowing Data is another great blog featuring data displays and infographics, with the occasional analysis. Edward Tufte’s site falls on the other end of the spectrum, with plenty of discussion and exploration of information design topics, but mainly at the tactical level of data display techniques. Most other sites I’ve seen either dive deep into the technical side of tools and techniques or collect and republish information design examples. The need for information design has always been high, but I find that too often the ability of the profession to meet that need effectively falls short. There is no shortage of opportunities for information designers to make a difference in the world and to ultimately help solve some of the biggest challenges facing this planet. Without a unified understanding of what the profession is and does, the full potential of information design’s role in society could be diminished, a casualty of fragmentation and misrepresentation. There’s quite a bit here–no doubt your 12 years of experience in the field is the 7/8 of the iceberg beneath this post. You’re raising many valid points and questions, though I’m not sure how many satisfying answers there are to be had. Thinking of the very phrase, “information design,” both words of this compound concept are extremely broad and flexible, connoting a massive array of possible meanings depending upon the speaker and the listener. 1. You wrote, “GOOD magazine has done a noteworthy job of incorporating information design in clarifying social, political, and environmental issues, but I often cringe at what gets published in the Transparency section. So much rich data, yet so few skillful or insightful visualizations.” I completely agree, and this is where the “about what?” “for what?” distinction is helpful. All of these fancy visualizations would be much more valuable if they were the response of a truly earnest question. But more often than not, they are merely the response to the availability of data. What a bore, and what a waste. 2. You also wrote, “It’s hard to find places to study information design.” True. However, at this (increasingly seasoned but still hopefully early) point in my career, I’m finding that there are few places to study much of what most people end up doing. Aside from those “big category” professions — medicine, law, the sciences, or perhaps the military — many of us studied things that don’t exactly translate to professions. (Don’t worry, I realize I’m generalizing dangerously here.) Sometimes I wish we could transition from a university to job dichotomy back to a broader field of options, which in addition to academic to professional tracks, included more direct paths from apprenticeship to practice. As always, I appreciate your thoughtful perspective and am glad you take the time to compose posts like this that are rich and broad. Let’s talk more! Thanks for sharing your thoughts on this! Tackling this issue — and more specifically, defining the problem situation — isn’t particularly easy, given the complexity and depth of the subject(s). At a bare minimum, this post was an attempt to open Pandora’s box and reveal what I felt to be core challenges facing a still-fuzzy field of study and practice struggling to define itself. Central to the problem, I think, is the tension between formalization and democratization, and the contradictory messages that this conflict sends about what information design is and isn’t. Pop culture and media perpetuate a shallow aesthetic of “beautiful data,” while schools and professionals largely work in silos to crystallize the substance and purpose of information design. Then again, some might argue the opposite. To your point about education not always leading to practice, the imperfect and largely non-linear trajectory of careers these days reflects the evolving nature of work itself. I think many colleges and universities are rapidly trying to keep up with marketplace shifts by creating hybrid programs of study and introducing more cross-disciplinary coursework. My concern is that, with the growing demand for information design skill and current swell of interest, few schools are doing much about it, leaving both potential employers and motivated young designers in a lurch. You are right in pointing out that there are more questions than answers here; I hope to expand (and amplify) this conversation and uncover the diversity of views into these topics so that, collectively, some answers might emerge. Well, more questions than answers or not, I enjoyed it as always! I’m looking forward to our next Skype chat.